Stores reference 6D/644. Size small. The rubber is quite clean and supple and the overall shape is very good. The majority of the mask is free of damage but there is cracking on the nosewire lugs and one end of the wire is detached. These could perhaps be repaired with careful application of glue. Other cracks can be seen at the edge near the nose, harness retaining lug and around the inspiratory valve. As usual these look more significant in the photos than they really are! The harness is faded and a bit stretched but does retain a little elasticity. Lined in beautifully clean pearl grey suede. 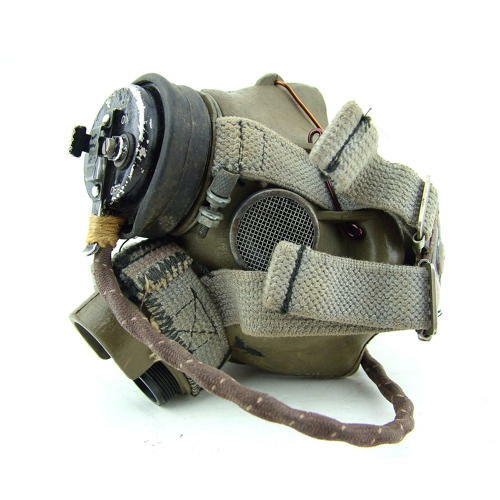 The mask is fitted with a type 48 microphone assembly (type 26 microphone, loom and socket). A good '+' used example. Stock code O22043.